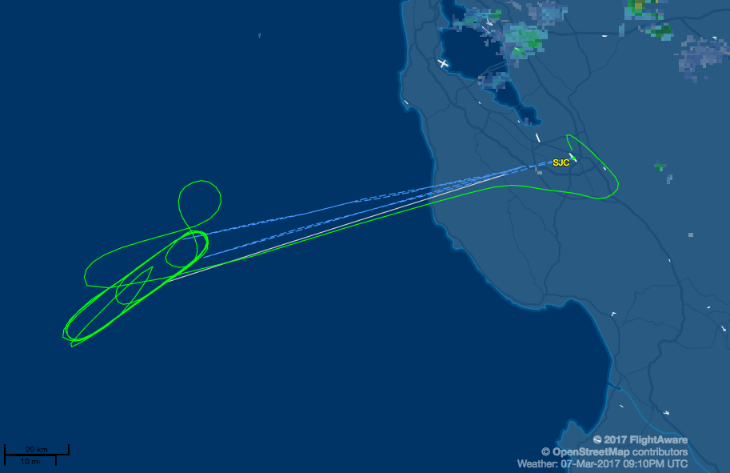 Last month we reported on a United flight that took off from SFO bound for Hawaii, but due to a mechanical issue, circled off the California coast for four hours before returning to SFO. 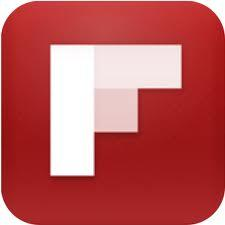 That post ended up being one of the most popular posts this year on the TravelSkills.com blog. Well guess what? It happened again on Tuesday, March 7. This time it was Hawaiian Air flight 43 from San Jose International to Honolulu on a Boeing 767. The flight was ready to go, but an onboard generator broke down requiring repairs, according to a CBSBayArea report. That delayed take off for two hours. Once the B767 took off pointed toward paradise, the generator malfunctioned again, which meant returning to San Jose. However, a big 767 loaded down with the fuel necessary for the 2,500 mile flight to Honolulu is not able to safely land. In order to reduce fuel weight, the pilot had to circle off the coast for three hours to burn off fuel. Turns out that like the United flight to nowhere, this Boeing 767-300 is unable to dump fuel to lighten up quickly for a safe landing. The only way to lose that weight is to circle a safe distance from the airport until enough fuel has burned off. But unlike the United flight to nowhere, Hawaiian was unable bring in another plane to re-accommodate passengers. CBS reports that passengers had to re-book flights for the following day. Here’s Hawaiian Airlines’ statement on the incident: HA43, scheduled to depart SJC at 9:10 a.m. local time, was delayed until 11:21 a.m. due to a part replacement. En route to Honolulu, the captain received notification of a mechanical issue and elected to return to San Jose. The aircraft landed safely at 2:52 p.m. local time and after inspection by maintenance the flight was later cancelled. There were 241 passengers and 11 crew. All passengers were re-protected on other flights and airlines. Yuck. And increasingly common, or so it sounds! 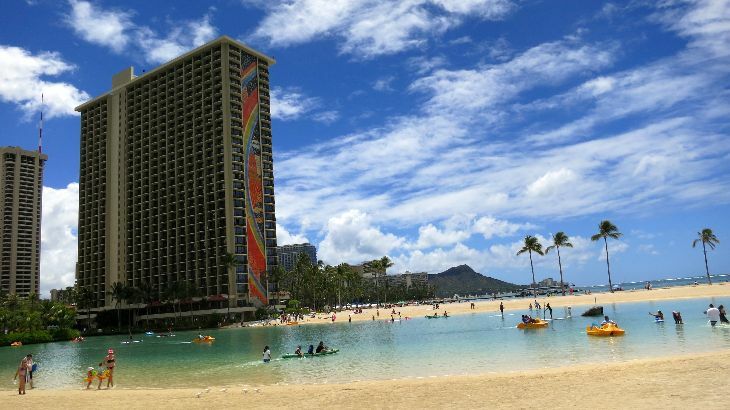 NOTE: Last time we posted about this, lot of readers wondered why the airline didn’t just fly the plane to Hawaii if they were going to circle for four hours anyway. The reason is that airlines don’t want to fly a faulty aircraft thousands of miles out over the ocean. Instead, pilots circle within a few hundred miles of the airport so they can land if they have to. 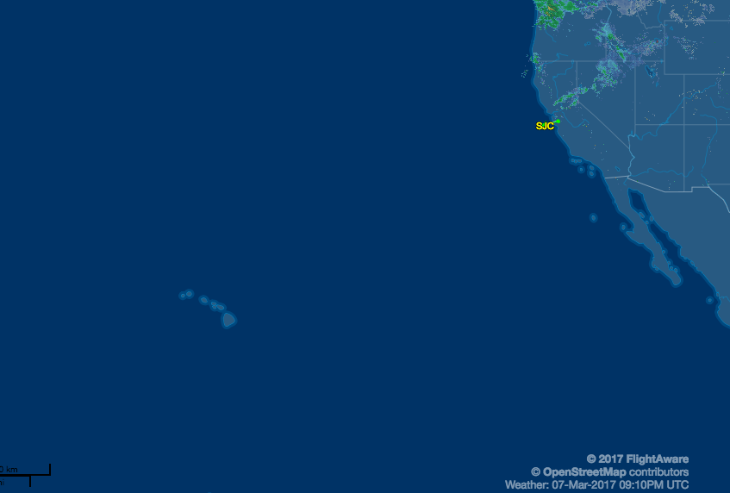 Here’s an image of how far the flight is to Hawaii… and how close the plane stayed to SJC. Don’t miss our report on United’s flight to nowhere last month!